There has been a long break on my blog here, sorry for that. Some of you may know the reason for my silence. I am in Kona on the Big Island since 10 days, days that have been extremely busy and stressful. My brain is like blown empty due to all the different features that it has to digest. Writing becomes a demanding task in situation like this. But I’ll try now. There are only 2 and half days left until race day night, for many a sleepless night. Moving through Kona makes you feel the tension building up more and more. This can bring about more problems for your immune system, and hamper your capabilities to cope with stress. Therefore, I boldly assume that many of you who are in Kona, Hawaii for racing the IRONMAN world championships are currently suffering from stress symptoms due to a weakened immunity. Especially your chinks start creaking and aching under conditions of stress. Be it the flight, the weather or the different quality of food, the distinct environment of microorganisms, or the tension and nervousness as such, all of these are factors challenging your immune and stress system respectively. Some of you may complain about back pain, issues with the Achilles tendon, the shin, the knee or the groins without any specific cause, you may have head ache, feel fatigued or come down with the symptoms of a sound infection of the upper respiratory tract, the sinuses, the gut, some of you may simply feel uneasy. There are many more items to be put on this list, but I think these are the most common ones. As I mentioned already it’s the weakest points of your very own body that start complaining first. These symptoms indicate that your body faces problems to cope with the stress factors it is exposed to. First of all this happens due to an immune system out of balance, an immune system that fails to fully unfold its healing properties, and is overburdened by compensating for all the stress issues. 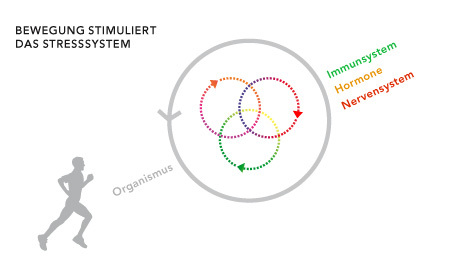 The immune system, you may not be familiar with this fact, plays an integral part within the stress system. A weak immune system reduces the ability to work under stress, it diminishes your stress resistance, and increases your susceptibility for the above mentioned symptoms and issues. Those of you who are in Kona may have bumped into us, the biestmilch crew with our swim caps, tattoos and tees. And some of you may now be interested in biestmilch and its power to stabilize immunity. The athletes who are on biestmilch for several years now complain about lesser and lesser health hazards, regardless of which origin be it a bronchitis, an allergy or issues with recovery. Ask Macca, Ronnie, Yvonne or Nicole, they all have their unique history with biestmilch. We would like to encourage you now to place your order in our online store, and we can deliver to you by hand on your way to the award party on Sunday. You shall spot the biestmilch crew there on the parking lot of King Kamehameha hotel. If you are in need of support before the race, drop us a message on facebook. We are right there at the pier to help you out. Hi, I attempted to e-mail an individual in connection with write-up although can’t make a call to people. Please mail personally when have a moment in time. All the best. I have an concept. Be extremely mindful, not all spirits, or types of spirituality are great and/or secure to become messing all around with.